Are you tired to have to plan and prepare for the holidays? Is it becoming extremely difficult to find the time to prepare your home for the holidays? Do you sometimes wish that someone else can take over your decoration job and come up with a tasteful outdoor holiday display for you? The long search is over. Springfield Gardens, Lawn & Landscaping offers an extensive array of themed holiday designs that can easily be adapted for your home or office. No more climbing ladders in the cold. No more untangling lights and checking for burnt out bulbs. 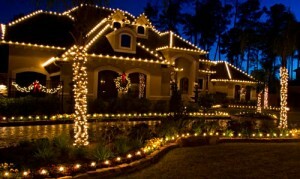 As installation experts, we will make sure that every bulb and string of tinsel is in its proper place. You will not have to worry about Christmas lights ever again because we will do the difficult chores just for you. At the end of the day, you can come home to a beautifully-lit and enchanting home that sparkles with all the joy of Christmas. We use only quality outdoor gears that are designed to withstand weather conditions and everyday wear and tear, so you can rest assured that your home is safe from electrical fires and other unwanted accidents associated with holiday lighting. Our staff can provide you elegant designs that would surely be the talk of the town. Springfield Gardens Lawn & Landscape clients receive priority scheduling with the removal of their holiday lighting come the end of the season. We guarantee that your holiday lighting system will be taken down no later than January 15th, so your house is ready to usher in the new season with a clean canvas. You can then schedule other important house chores such as touching up the paint job for your outer walls or checking the HVAC system in your home. Because our products and services includes install and take down, you would not have to worry that it will take us a long time to get everything in place and packed away. We even store your holiday lighting safely at our off-site facility so you can use your storage space at home for other things. Plus, we contact you at a pre-determined time to arrange scheduling for the next year’s holidays – just one less detail you need to remember. All you have to do is sit back and bask in the beauty of your home. After all Christmas time should be spent enjoying the company of you family, not burdened with stress and worries of getting your decorations up. Give us a call at (417) 882-7800 so we can set up a customized plan for you.